The Sheldon Jackson Museum is pleased to announce that the Friends of Sheldon Jackson Museum have been awarded a grant in the amount of $29,665 from the Lindblad Expeditions-National Geographic (LEX- NG) Fund to support the Alaska Native Artist Residency Program. The funding will provide invaluable support for the Sheldon Jackson Museum and Friends of Sheldon Jackson Museum to host up to ten Alaska Native artists-in-residence in 2018 and 2019. This summer, the LEX-NG grant will be used to support four Alaska Native artists-in-residence who will work in the Sheldon Jackson Museum Gallery and provide free hands-on classes teaching their art forms, give lectures, engage with visitors, and share their process through creating artwork at the museum. While creating in an open-studio sort of setting, the artists will discuss their techniques, inspiration, methodologies, and share information about their art and themselves to connect museums visitors to their culture. Artists will also be paid to study the Sheldon Jackson Museum’s permanent collection on exhibit and in collections storage, providing them a chance to examine material culture created by their ancestors. The Alaska Native Artist Residency Program this summer will include four artists. 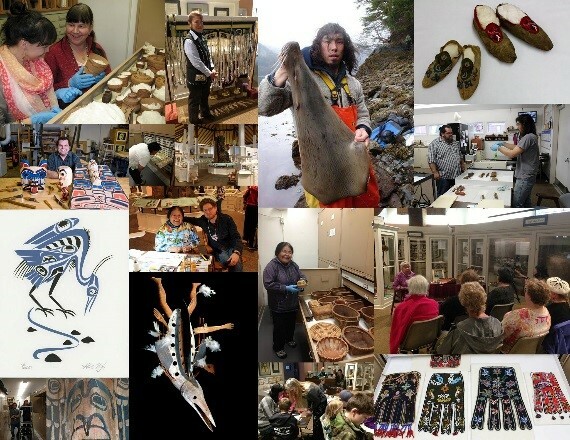 Participating artists include Tlingit weaver, textile artist and beader Chloe French (June 8th -30th), Tsimshian carver and silver engraver Abel Ryan (June 30th-July 21st), Tlingit Chilkat weaver Lily Hope (July 26th-Aug. 12th), and Inupiaq ivory, bone and wood carver Jimmy Carlisle (Aug. 22nd-Sept. 8th). Both Chloe French and Abel Ryan will be co-hosted by the museum with the Sitka Fine Arts Camp. space limitations. For the materials list and to sign up or for any further details on the residency program, people may call (907) 747-8981. To view events related to the Native Artist Residency Program, visit the Friends of Sheldon Jackson Museum Facebook page or the Alaska State Museum website at http://museums.alaska.gov/sheldon_jackson/sjnativedemos.html . The Native Artist Residency Program is made possible through the support of the Lindblad Expeditions-National Geographic (LEX-NG) Fund, Sitka Fine Arts Camp, Alaska Airlines, the Friends of the Sheldon Jackson Museum, and private donations. Summer hours at the Sheldon Jackson Museum 9 a.m. to 4:30 p.m, Tuesday through Saturday. Summer admission is $7 for adults and $6 for seniors. Visitors 18 and under are admitted free of charge. Assistance is available for visitors with special needs. Please contact the museum for more information at 907.747.8981. For additional information about the LEX-NG fund go to https://www.expeditions.com/why-us/global-stewardship/ .